I bought a few old Baum Bugle issues at OzCon in Portland, and they have some interesting content. There was apparently a sometime recurring feature called “Footnotes to Oz” that explained names in the Oz series, written by Jerry Tobias. The only issue I’ve seen it in is the Spring 1978 one, but it mentions others. This particular article provides speculation on the sources of the names Betsy Bobbin, Jellia Jamb, Mangaboo, Ork, Para Bruin, Pingaree, Salye Soforth, Tarara, and Woot. The words to discuss for the next time are Bell-Snickle, Flummux, Isle of Phreex, Jol Jemkiph Soforth, Karwan Bashi, Munchkin, Pastoria, Quiberon, and Tippetarius. Some of these, and many other names in the series, are based on obvious wordplay, while others don’t seem to have any particular meanings at all. You never know, though. I’ll occasionally search for Oz terms in Google when I’m bored, and I found out that there’s actually a place in Australia called Boolooroo. Suggestions for the word “Mangaboo,” used by Baum for heartless vegetable people, include the mango, mangosteen, mangrove, mandrake, and mangel, combined with “boo.” I’d be interested in knowing whether L. Frank Baum pronounced the “ng” part as in “finger” or “hanger,” but I doubt that information is available anywhere. The “man” part could refer to how they’re human-shaped. 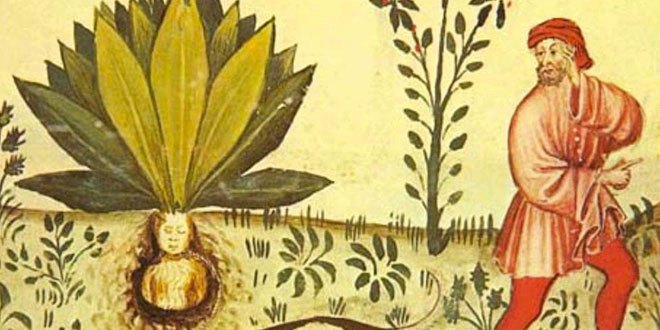 Folk etymology has it that the mandrake is called that because its root likes like a tiny man, but since the word apparently comes from the Greek mandragoras, this was probably not the actual origin. “Gaboo” appears again in the name of the country of Oogaboo, and later in John R. Neill’s Gabooches. The Wizard of Oz misspeaks the name of the people as “Gabazoos.” Martin Gardner and Michael Patrick Hearn suggested that “Jellia Jamb” might be a play on “jelly or jam,” but others aren’t sure about the “or” part. It’s definitely a play on words, though, so I’m guessing that the pronunciation “Jell-EYE-a” is wrong. Jack Snow speculated that Woot’s name might have been an anagram of the initials for “Tin Woodman of Oz,” but I’m not sure when the character was named relative to the book in which he appeared. There’s very little for Pingaree, but Fred Meyer later mentioned that a man named Hazen Pingree was Governor of Michigan within Baum’s lifetime. Gilgad from the same book might come from Gilead (is there no Baum in Gilgad? ), and is also similar to J.R.R. Tolkien’s later Gil-galad, although that’s probably a coincidence as I know of no indication that Tolkien read Baum. I’ve seen it suggested that “Munchkin” might have something to do with Munich, and that “Gillikin” comes from the gillyflower (which is sometimes purple), although it’s pronounced with a hard instead of a soft G.
The discussion of “Ork” is interesting, bringing up the similarity to “stork,” “auk,” and “roc,” all kinds of birds (albeit a fictional one in that last case). The roc might also have inspired the Rak from Tik-Tok, although I’ve also come across speculation that it could be “car” spelled backwards with a K instead of a C, as the creature has an internal combustion engine of sorts. The Bugle column also mentions the Orks of Beowulf that likely inspired Tolkien’s Orcs, and a reference to “Seales and Orcs” and “Sea-mews” in Paradise Lost. These Orcs are said to be orcas, or killer whales, but it’s possible Baum thought they were birds. Ruth Plumly Thompson seems to appropriated a lot of foreign place names for her own creations. Mogodore, the robber baron from Jack Pumpkinhead of Oz, might well have been named after Mogadore, a town in Morocco. The Candy Giant Bangladore‘s name is quite close to Bangalore in India (perhaps combined with “bang the door”). Boglodore has a similar name, but as far as I know it doesn’t resemble that of a place. There’s a Samandra in Turkey, a Corabia in Romania, a Fort Mudge in Georgia, a Malacca in Malaysia, and a Quiberon in France. That last one is a peninsula in the sea, which might explain how a sea creature came to have the name. Tattypoo and Menankypoo are probably references to Titipu and Nanki-Poo in The Mikado, with which one is a person and which a place reversed. The OzCon program mentions the similarity of names between Baum’s Nikobob and Thompson’s Nikobo, although the latter might have also been influenced by kiboko, the Swahili for “hippopotamus.” It’s commonly thought that the name of Tarara comes from “Tarara-Boom-De-Ay,” although Meyer and Christopher Gise also stated that it’s Ararat spelled backwards. And I discussed “Karwan Bashi” in this post; it’s an actual term for a caravan driver, not just Thompsonian nonsense. This entry was posted in Authors, Characters, Etymology, Humor, J.R.R. Tolkien, Jack Snow, John R. Neill, L. Frank Baum, Language, Names, Oz, Oz Authors, Places, Ruth Plumly Thompson and tagged bell-snickle, beowulf, betsy bobbin, boolooroo, christopher gise, corabia, dorothy and the wizard in oz, footnotes to oz, fred meyer, gabooches, gilbert and sullivan, gillikins, isle of phreex, jack pumpkinhead of oz, jellia jamb, jerry tobias, karwan bashi, mandrakes, mangaboos, martin gardner, menankypoo, michael patrick hearn, mogodore, munchkins, nikobo, nikobob, oogaboo, orcs, orks, para bruin, pastoria, pingaree, quiberon, rak, rocs, salye soforth, samandra, tarara, tattypoo, the baum bugle, the mikado, the tin woodman of oz, tik-tok of oz, tippetarius, wizard of oz, woot the wanderer. Bookmark the permalink. I’m a big fan of etymology, and the origins of names and places is endlessly fascinating to me, especially when the authors put so much thought into it. Baum, Dunsany, Tolkien, Lovecraft, Howard and Moore all put considerable thought into their names. There was a fascinating poster on one of the old Oz forums who revealed lots of Baum-name connections to Gaelic, which makes sense I think. I don’t recall if he ever got any of that published in a Bugle, but it deserved to be. Anyway, there’s a lot of great stuff in the Bugles that are languishing in obscurity because they’re out of print and back issues are expensive to purchase. I’ve said it before, but it bears repeating that I’m really hoping they’ll continue soon with the Best of the Baum Bugle collections. Print on demand facsimiles would be helpful. Oziana too. I know there’s one Oz story I’ve never read, “The Tin Woodman and the Tin Soldier of Oz,” that to my knowledge has ONLY ever been published in the Bugle. Some of the Gaelic origins for Oz terms were a bit of a stretch, but that doesn’t mean there wasn’t something to it. I believe you can find the relevant posts at the pumperdink.org website.